NOTE — This story originally ran in the October 31, 2016 issue. But since Moonlight has now won the 2017 Golden Globe Award for Best Drama Picture of the Year, we decided to share the story again with readers who may have missed the first run. The film received a total of 6 Golden Globe nominations. Moonlight, an indie movie with a budget of only $5 million, is the sleeper film that’s taking Hollywood by storm. Leading media ranging from the NY Times, Rotten Tomatoes to Variety magazine, are giving it 4 and 5 star reviews. One major film critic has even asked: “Is Moonlight this year’s Best Movie?” According to the movie’s new Golden Globe Award win, the answer is Yes! The film was a top favorite at the 2016 Toronto International Film Festival. Moonlight is a rather coming of age story that chronicles the life of a young black man from childhood to adulthood, as he struggles to find his place in the world while growing up in the rough neighborhood of Liberty City in Miami. The film stars Trevante Rhodes, André Holland, Janelle Monáe, Ashton Sanders, Jharrel Jerome, Naomie Harris and Mahershala Ali. Moonlight touches on several issues ranging from bullying, life in a drug infested community, poverty, a poor young fatherless boy and later man who’s not only trying to find his place in the world, but also his own sexuality. Moonlight was adapted from a play by Tarell Alvin McCraney, with the screenplay being written and directed by Barry Jenkins. Brilliantly written, not to mention the standout cinematography, the film consists of three chapters —“Little,” “Chiron” and “Black.” But all three names all refer to the same character in various ages and stages of his life. 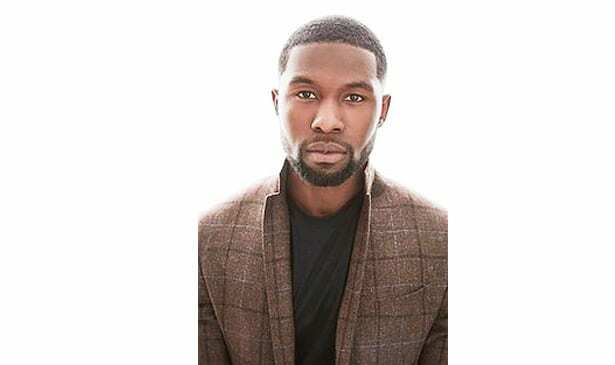 Actor Trevante Rhodes does an unforgettable performance as “Chiron.” It’s a role that speaks volumes about what is not said in the silent and often pensive young character. The Dallas, TX area actor had an impressive career in track and field at the University of Texas (Austin). It was during his time on campus that Rhodes was smitten with the acting bug. After graduation, he headed to L.A. and began a string of acting gigs on TV and film. One being the role of ‘Ramsey’ in the Tyler Perry / OWN series If Loving You Is Wrong. But it’s his brilliant portrayal in Moonlight that has now placed him on Hollywood’s ‘Next Big Thing’ list. Here, Trevante answers 5 Questions about being one of the principal stars in the new breakout film Moonlight. TRIBUNE: As everyone knows, you were an outstanding track and field athlete who was clearly on your way to maybe competing in the Olympics one day. So now you’re on your way as an actor. Some are already talking pre-Oscar buzz for Moonlight. If you had to choose between an Oscar and an Olympic gold medal, which would it be? TREVANTE: “An Oscar! Having an Olympic Gold medal is good I’m sure. But I love acting now. I used to love the feel of winning when I was competing in track and field. MOONLIGHT is currently playing at the Belcourt Theatre.